* Living room 32' flat screen Cable TV (DVD/VCR). * 2 off-street parking spaces. 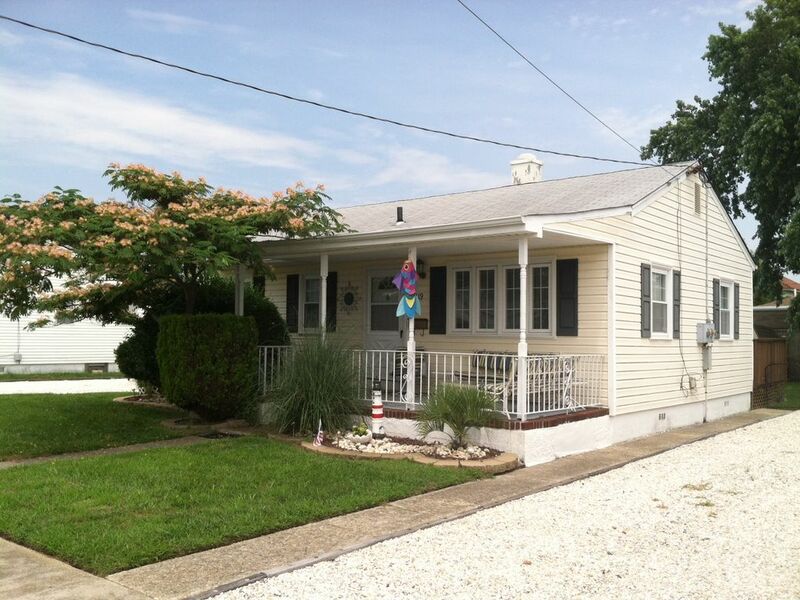 Located approximately 2 1/2 blocks from the beach and 2 1/2 blocks from the bay. Beach, beach, and more beach, sunbathing, Hiking, Biking, Golf, Tennis, Basketball, Fitness Center, Gym, Horseshoes, Miniature golf, Amusement Parks, Fishing, Crabbing.Wildlife Viewing, Horseback Riding, Shopping, Restaurants, Live Theater, Cinemas, Museums, Sightseeing, Swimming, Snorkeling/Diving, Boating, Sailing, Surfing, Windsurfing, Parasailing, Jet Skiing, Shelling. we enjoyed this little house. had some privacy even though all houses are quite close to each other. nice deck. very responsive and nice owner to deal with! This beautiful house was an awesome place to stay! It's close to the beach and a beautiful park on the bay side that sometimes has musicians performing while watching the most beautiful sunsets. The back yard is fenced and secure for your dog. The neighbors are nice. The owner is very helpful and very nice to work with to make your stay a goid one! We would love to come back again! Very cute. There was plenty of space and we loved the back yard for our dog. The location made it easy to get to the beach and have a variety of activities. We would definitely stay here again. Amazing! Landlords are very friendly! Amazing! We love staying here! Perfect location! Close to activities and also peaceful! Best of both worlds! We stayed two years ago and had such a great time we decided to stay again! We rented this home for the week with our 2 dogs who loved the fenced in yard and walks to sunset park. The house was just perfect and had everything we needed. It was clean with plenty of room for our family of 4. Big plus was the outdoor shower with hot water. Could beat the location - close to the beach & the bay. Lots of places nearby to eat. Nice quiet relaxing spot. Will rent again. Located between beach and bay, this property enjoys the best of both. A short walk east takes you to Wildwood Crest's great free and wide beach to enjoy sun, surf and sand. A short walk west takes you to Sunset Lake with all the water sports you could want, including jet skiing, water skiing, and boating. Half-day and full-day party boats take you fishing. Other boats take you whale watching. Sunset Lake is known for its fabulous sunsets and free live music concerts. Walking and jogging trails are along the Lake, walking your pet, biking. The trolley bus on Atlantic Avenue takes you to the boardwalk. The 2.5 mile boardwalk has amusement rides, shops, restaurants, fast food, theaters and water parks. The whole family can enjoy the double-decker merry-go-round. Take a ride on the East Coast's tallest Ferris wheel or try the 'The Great Nor'Easter,' one of only four suspended looping roller coasters in the world. food festivals, fireworks and other events. Victorian Cape May is a short drive south. Atlantic City Buses are available, or drive north 35 minutes to enjoy renoumed nightlife attraction or try your luck at your favorite casino.